If you were using Time Clock MTS with a fingerprint scanner you could be eliminating buddy punching and payroll fraud right now. Thousands of other companies are reducing their payroll costs and administration expenses using Time Clock MTS. Can you afford not to? Using Time Clock MTS with a biometric scanner will help you to reduce or eliminate payroll fraud immediately. If you’re using a manual time card system Time Clock MTS will prevent employees overstating their hours. If you’re already using an electronic punch clock or other time clock software then Time Clock MTS will help to eliminate the practice of employee buddy punching. Our software works with fingerprint scanning hardware from Digital Persona. This includes their high quality stand-alone U.are.U 4000 and 4500 USB scanners as well as their line of keyboards with integrated finger scanners. Plug a Digital Persona scanner into your computer, install the Time Clock MTS fingerprint drivers and you’re ready to use Time Clock MTS with full fingerprint authentication. Setting Up Time Clock MTS with a Finger Scanner is Simple! We’ve been using the biometric fingerprint readers and by far this is the best method to keep track of our employee’s time. You can see exactly how easy setting up Time Clock MTS is by looking at our fingerprint time clock tutorial or by following the simple steps below. Plug your fingerprint scanners into the computers you wish to use as biometric time clock stations. Digital Persona USB finger scanners can be purchased easily from California PC. Install the Time Clock MTS Administrator program where you want to administer the software and the client software where you want employees to be able to clock in and out. Enrol your employees fingerprints, this is done on the screen that you can see at the top of this page. 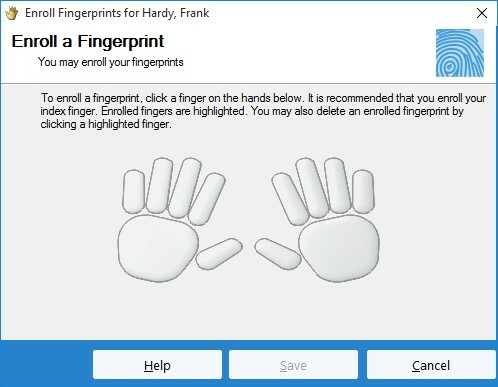 Each employee can have two fingerprints stored. Turn on the Use Fingerprint Scanner setting on the Interface Settings options page in Time Clock MTS. That’s it! When your employees clock in and out they’ll be prompted to scan their fingerprint to confirm their action. They will do this on the screen shown to the left.